Oh, hey, is that my picture? (I’m @rorru, on Twitter!) Took a picture of that earlier today and shared it on the Twittersphere. Apologies Beth, I got linked to one on facebook hosted by the other guy, but you were indeed the first. Just checked it now. Thankies. Just thought it was worth mentioning to get the right credits on it. Yay! Sonic’s in Guiness again! LOL at the photo caption. Congrats! Awesome recognition for the Sonic community. I’m trying to get in the book now for largest sonic collection (1000+ items), but they won’t take it unless it’s at least 3000. According to this website, in the 2010 edition, the Suumer of Sonic gets a mention on page 206. On page 207 are the records for Sonic 2 and 3. Now for somebody with the 2010 edition to take a pic. I saw this myself years back, and so verify it. 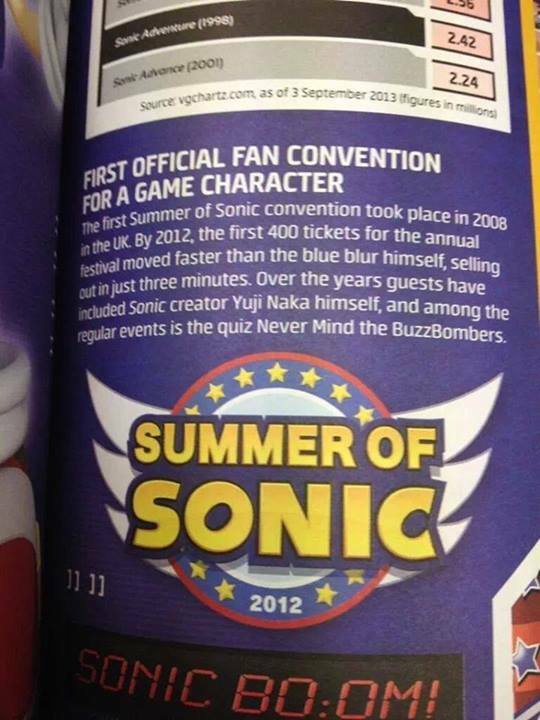 Congratulations Summer of Sonic 2008 in six years ago wins Guinness World record ever! Also I heard Sega is going to make a new Sonic games in 2014 Sonic BlueThunder or Sonic Thunder Storm, then their is going to be Chao Garden back in SA1 and SA2 hopeful they going make it huge Chao Garden in Sonic Adventure 2 was awesome and new Sonic Characters or old Sonic Characters. Is going to be Wii U or Xbox one, and PlaySatation4 It not like going be like Sonic Lost World or Sonic 06! Sonic Thunderstorm is the worst hoax of 2013. Lol! But seriously, no. That is an Archieverse Sonic convention in a comic book. Wow, I’m kinda shocked that SoS was the first official fan convention for a game character. Awesome.